Of all the works in Robert Motherwell’s oeuvre, no series is so consistent in its exploration of a singular motif, so instantly recognisable, so deep in the artist’s character, as the Elegies. 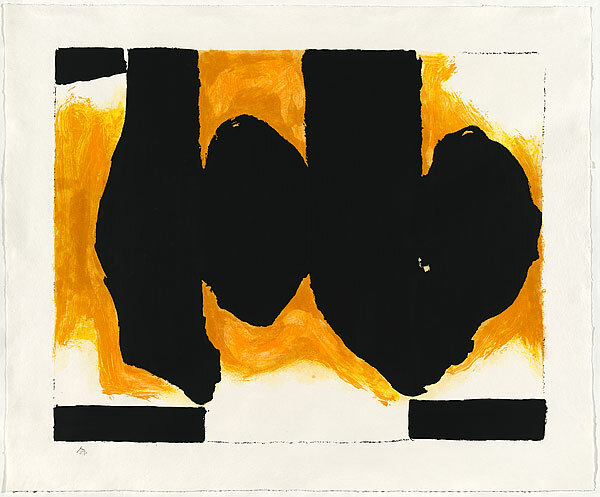 Constructed of ovoid forms balanced between vertical rectangles, a ‘massing of black against white’, the elegy motif first emerged in 1948 in an ink drawing illuminating a poem by Harold Rosenberg, the ‘brutality and aggression’ of which Motherwell hoped to give visual expression. 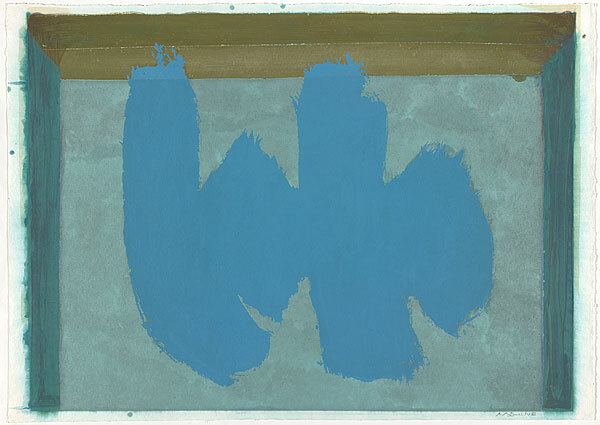 The abstract forms resonated with Motherwell and he soon returned to them in the painting At five in the afternoon 1949, titled after the refrain of Federico Garcia Lorca’s poem dedicated to a fallen matador, Lament for Ignacio Sanchez Mejias. For Motherwell, Lorca’s poetry and the events surrounding the Spanish Civil War were ‘general metaphors of the contrast between life and death and their interrelation’, themes which he would explore in endless variations through the archetypal image of the elegy. Late prints made with Ken Tyler, such as Three figures 1989 and Burning elegy 1991, introduced colour to the motif by way of dyed and pressed paper pulp. The characteristic palette of blacks, whites and earth colours was abandoned in favour of brilliant reds, turquoise blues and citrus yellows, resulting in works of a markedly different character. No longer imbued with grief and loss, they speak of the light and air of the Mediterranean. These works and many more are featured in Robert Motherwell: At five in the afternoon, on display in the Orde Poynton Gallery until 6 October 2014.